Had horrible credit score, a ton of student loans Also had some late payments, and derogatory marks on my credit report. Have to thank cap one for giving me a chance to rebuild. Got a $500 CL with a 575 score. I had very little credit history. Score was about 650 when I applied. Was approved for $300. After 4 months, my limit was bumped to $500. If you have very little history, I would say that this is a great card to start off with. Before I got this card, I had Cap One's secured got. Put in $500 as a deposit. After a year, I decided to give this card shot to get a true unsecured card. I was surprised to be approved with a $500 limit. My score was only about 570 I think when I got approved. I just to keep my utilization low, pay on time and keep my score inching up bit by bit. Thanks Cap One. Had a 545 score (TU). Applied, got approved, $300 CL. Target is to rebuild and get a 700+ score in 2 years. Have a score that is close to 600 but got two delinquent accounts that are 3 years old. Still got approved with $300 CL. A divorce 8 years ago destroyed my credit and I have been living without credit for many years. Also have one paid off judgement that is still on my report. But I decided that I need start to rebuild and despite a 645 score, I got approved for $500. I have very little credit history. Just my school loans (but still in my grace period). I have an ok income and a fairly low rent. Got accepted with a $500 limit. oh, score is about 700. Both me and my spouse ran into credit problems and our scores took a big dive. We have had charge offs in our account. My score was 640 and I got approved for $900. After 5 payments, I got a CL increase. I just charge about $100 a month on the card and pay it off in full. May score has steadily improved and I hope to get to 700 soon. 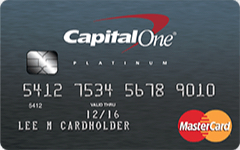 Have the Cap One secured credit card but only with a $200 limit. I did not want to put down any more deposit and realize that I need a higher limit. I applied and got approved for $500. I will be canceling my secured card and getting back my deposit. Scores: 650 TU and 660 EQ. 1 paid collections in the past year. Got divorced and credit score tanked. Got a secured card from a credit union and was looking for an unsecured card. After a bit of research, I decided to go for this. Got approved with a $300 limit. I am glad my good payment history with my secured card helped.